Issues in the Icebox help give the team clarity on agreed-upon low priority items that aren’t worth closing, but just are not in your upcoming planned work. It’s also helpful to prevent re-opening of Issues that were once de-prioritized! The Development Backlog should be prioritized top-to-bottom by importance. Everything at the top should be spec ready, have a clear acceptance criteria, and be estimated. We recommend having bi-weekly backlog grooming sessions to keep these Issues fresh, check priority, and ensure work is estimated upfront. Keeping this pipeline prioritized helps teams understand the most important issue to work on next should everything in the Sprint be finished ahead of time! Your Sprint Backlog should also be prioritized. This helps the entire team know the most important work that you’ve committed to accomplish first in the sprint. This might be a high priority bug, or a back-end issue that is blocking front-end work. Only accept Issues and smaller pieces of work into the Sprint. Epics are large bodies of work, or groupings of user stories. Epics should not be estimated, but instead help teams understand large scope projects. When accepting work into the Sprint, be sure to breakdown Epics into smaller Issues that can be estimated and discussed. Smaller pieces of work are easier to understand, de-risk from having unknown blockers that might not be present during Sprint planning, and can easily be moved throughout the Board and closed quickly. Below we have some tips on when to check in on it, and how to get back on track if you notice you’re above the ideal line. Having your Burndown in a central, visualize location helps the team constantly check on Sprint progress. If you don’t have a central screen, we recommend looking at your Sprint at least 3 to 4 times during the Sprint to check on progress. In the example below, the team isn’t burning down in the ideal Velocity needed to complete all committed to story points before the 30th. Checking mid-Sprint allows the team to converse on potential blockers, whether there was scope creep or surprises that came up once work started that created complexity, or if there was interruptions to the Sprint that caused unexpected work. If you hit the end of the Sprint and need to move Issues sprint-to-sprint, before re-assigning a new Milestone, re-assess priority and estimation of the Issue you’re moving over. Did something creep up that made this issue too complex to get completed within the Sprint? Is this still a priority against the other Backlog items? Is the estimate on this Issue still accurate? We recommend using a way to nominate Issues that need to be re-discussed as part of your retro and planning process. Using a Sprint Candidate Milestone that does not have a deadline is a great to start a nomination process. Whether it’s work from a previous Sprint, important bugs, or technical debt, this process gives everyone in the team a way to raise their hand to speak about important issues and be part of the prioritization conversation. 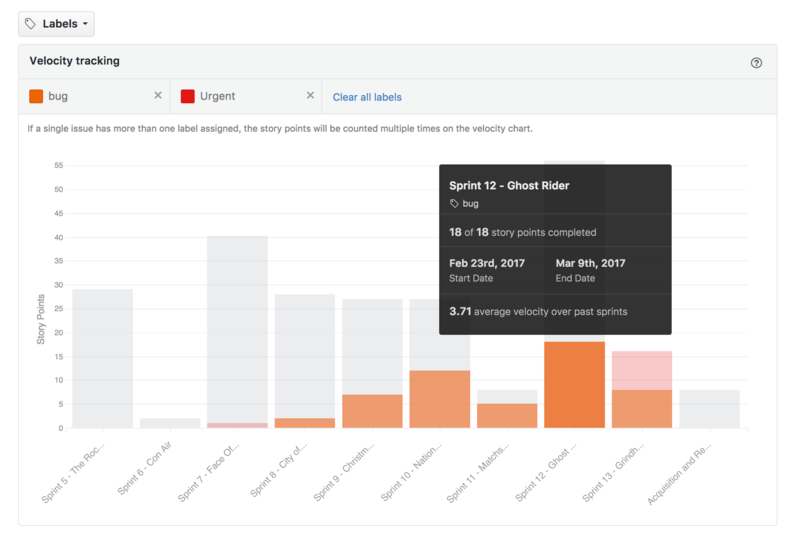 ZenHub reports can be filtered by label to help teams understand what type of work is being accepted into the Sprint and where the team is historically spending time. You may want to use an “Interruption” label for example, to assess how many interruptions mid-Sprint come up. We also recommend using the bug label to track how much time is spent fixing previous code. Over time, if you start notice that more and more bugs are being worked on, you might want to have a team huddle to focus on how you can improve your QA or testing process. If you've created a multi-repo task Board, ZenHub makes it easy to create a GitHub Milestone spanning several repositories. This eliminates the need to duplicate work or sync Milestones together. If you need to track cross-repo work it also helps ensure that the start and end date, and title cross-repo are all the same to power cross-repo reporting! If you need to make any edits to your GitHub Milestones, using the Milestone page also helps edit and close those Milestones in bulk. This helps teams save time having to dive into each repo in GitHub to otherwise close or edit Sprints. Use the Milestone filter to bring up your current Sprint. We recommend having this in an always visible location in your office to consistently keep ahead of your Sprint. You can use full screen mode to maximize space on your central screen! Having it in a central location, and using it to facilitate daily standups or scrums helps you get into the habit of closing Issues on time (to keep your burndown updated! ), help chat about potential blockers, and uncover any potential unknowns that weren’t originally discussed during estimation. You can also layer filters on top of each other, such as the assignee filter to pull up your own individual assigned Sprint work to get an even more focused view. Everyone can further customize their Board and remove Issue card metadata using the Board options menu from the sidebar to customize what you see, and help get real-estate back. What’s the difference between tracking a Sprint using a Milestone and the purpose of a Release report? They help with management of long term initiatives because they give teams forecasting abilities that help teams manage risk. By highlighting scope changes, and dynamically updating as Issues get added, removed, and completed, Releases show how scope changes impact deadlines. Learn more. What do we do if we have a different definition of ‘done’ than closed? ZenHub reports automatically use ‘closed’ as done, but you can use the burn pipelines on the Burndown chart to define a different definition of done. This will take the time at which the Issue moved into that pipeline to report as ‘done’ on the Burndown. We often have a lot of issues closed at the end of the Sprint, making it hard to get value out of the Burndown. Can we track incremental progress towards Issues to avoid end-of-sprint closing sprees? Having a discussion about the size/scope of the Issues you’re accepting. Are they too big? Is there a better way to break down Issues? Do you have a central location to keep the Burndown or Board visible for the whole team? This can help with habit changes around keeping Issues updated and closed! Prioritize the lowest estimated Issues in the Sprint first to close quick wins before taking on more complex Issues.